A Campaign quota is a particular target, specifically per status in a given Campaign as a required minimum for a specified period (daily and hourly). The admin can monitor the agents to see if they have met their quota for the day. This can help everyone to be updated whenever their account is doing well. In Campaign Settings, click on Advanced Configurations Tab and click on Quota. Notify Agent When – select the conditions before sending notifications to agents. Never - Campaign will never stop dialing leads. Item will be listed under Hourly Quotas List indicating the Quota Value, Progress and Remaining. Item will be listed under Daily Quotas List indicating the Quota Value, Progress and Remaining. 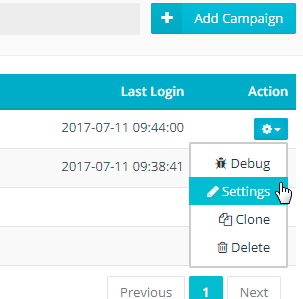 Note: If Campaign Schedule is Inactive, an error message window will appear and you need to activate the Campaign Schedule first.